Sign language was an integral part of Christina Aguilera's dance performance last night in the season 11 series finale of Dancing With the Stars. Check out the performance below. Don't you think the signing really enhances the emotional impact of the song and the performance? I didn't watch DWTS, but was happy to see the performance here. I agree 100% that the signing enhanced the emotional impact of the performance/song. My girlfriend watched it and I was surprised her routing included SOME signing. 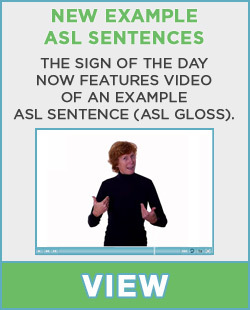 It's was really cool to see since I am currently learning ASL in college. I perform worship songs in ASL at our church and it without question enhances the song to deaf and hearing alike. I've had hearing people tell me how moving it is, so my answer is yes it does. I thought this was awful and jerky, what a poor representation of ASL to music, there was no emotion or feeling to it at all it looked horribly choreographed and robotic...and Christina sounded terrible too, I wish I was Deaf whenever she opens her mouth to sing!!! I'm hungry for anything ASl, but I thought it would be faster and more powerful signing. Not the best signing to music video but still cool they included ASL as part of the song on DWTS. It's refreshing to see ASL performed by a group of out-on-the-stage dancers, rather than just an interpreter in black,hiding at the side of a concert (as I saw at a choral concert last week). I thought there could have been less dancing and more signing. The beginning was good when it was only the one woman signing. When the dancing started it went downhill.